1907 built for A.J. Farmer, Kawau and W.H. Brown, Auckland. 1931 dismantled at Auckland. 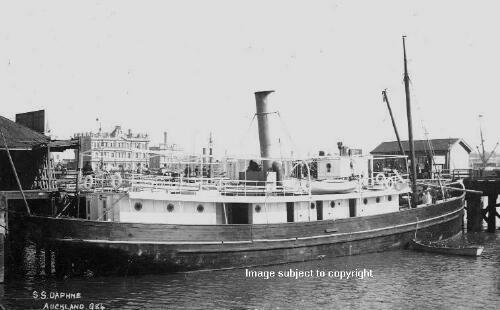 Hull sold to A.G. Frankham Ltd.
1938 registered as M.V. AWANUI. 1939 September 5th chartered by the Navy and used as an examination vessel. 1941 November 18th released for coastal trade. 1942 August sold to South Taranaki Shipping Company. However, hull and been condemned and engines were used in the coaster TIROA. Hull run on on the mud at St Mary's Bay, Auckland.